The Information On This Page May Be Viewed And Printed In PDF Format By Clicking The Image Below. PDF Software Such As The Free Adobe Acrobat Reader Is Required. 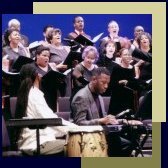 The Bronx Concert Singers (BCS) is a non-sectarian, mixed-voice, volunteer chorus located in the Parkchester section of the Bronx, New York. Since 1981 the chorus has attracted adult music lovers of all ages and backgrounds who are passionate about choral singing. With music director Robert René Galván, BCS performs traditional European choral masterworks, and an array of music from our world's diverse cultures. BCS presents two major concerts per year performed with either orchestra or chamber ensemble. Recently performed works include Faure's Requiem, Mozart's Requiem and Haydn's Missa Brevis St. Joannis De Deo. BCS welcomes both experienced and novice singers. Sight-singing and/or the ability to read music is preferred, but not mandatory. Our Music Director may ask new singers to perform a brief audition consisting of pitch recognition and vocalizing. The Bronx Concert Singers is the chorus-in-residence at St. Paul's Evangelical Lutheran Church. Rehearsals are held in the church hall on Tuesday evenings from 7:30-10:00 pm. At the beginning of each semester the Music Director will announce which solo parts are available for auditions. Additional solo opportunities may also be available throughout the year for our fundraising events and community outreach projects. Dues are $100 per year payable in two installments of $50 per semester, collected in September and January. An individualized installment plan can be arranged by speaking with the chorus treasurer. There is also an additional charge per semester to cover music costs. McGraw Avenue is the side entrance to the church, directly across the street from the playground. Please ring the bell on your left-hand side. Click the image below for travel directions.